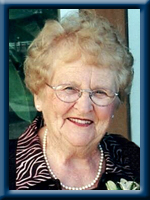 MacDonald; Vivian G., 92, of Liverpool, Queens County, passed away peacefully in Queens Manor, Liverpool on Wednesday, May 14, 2014. Born in Newellton, Cape Sable Island, she was a daughter of the late Archie and Ida (Quinlan) Newell. Vivian was a member of the Liverpool United Baptist Church and president of the Women’s Missionary Society for 17 years. She was very artistic enjoying quilting, crocheting, rug hooking, cooking and entertaining. She will be always remembered by her family for having fun. She is survived by her daughter Cheryl MacDonald Deda (Ralph Deda) of Liverpool, her son Byron of Sydney, her granddaughter Jennifer MacDonald (Gerald Villegas), her great-grandchildren Aiden and Logan, her sister Martha (Thomas) Davis of Shelburne. She was predeceased by her husband Robie, her sisters Lynden Thomas, Rosalie Kenney, her brothers Robert, Dean, Freeland and Edward. We were sorry to learn of the death of Vivian. She loved you very much and remembered you in her prayers. We have fond memories of time spent with Vivian and Robie. We are grateful to the Lord that Vivian was following the Lord Jesus. We are also grateful for the promise of Jesus, “I am the resurrection and the life. Whoever believes in me though they die, yet shall they live.” John 11:25 We are praying for you . So very sorry to hear of the loss of your loved one, condolences to the entire family. I had the pleasure of having Vivian as a dear friend and will truly miss her. We were so sorry to hear of Aunt Viv’s passing. Cheryl I remember staying at your place and how kind your mother always was to me. Curtis and I had just talked about going to see her just a couple of days before she passed, now we are upset because we did not get there. Remember all the good times to help get you through this upsetting time. Take care. Cheryl & Byron, I was very sad to learn of Aunt Viv’s passing. She was always a kind person and very fashionable. She loved you both with all her heart, so remember her for that. I just feel good that I was able to visit her a few days before, that she knew me and smiled so widely when she saw me. I’m thankful I got to kiss her goodbye. Just know ‘Mom & Dad’ are together again, remember their love for you. We are so sorry for your loss. Your memories will always be with you. We always enjoyed our visit with Vivian and our talks about our family history. We are saddened to hear about the passing of Vivian, our dear friend for a lot of years. We have fond memories of visiting with both her and your dad in their home and playing board games with them and visits when we just had great conversation and, of course, no one left their house without having some of Vivian’s great food !! There was a lot of laughter during those times. Your mum was a great testimony of how a Christian should live their life. She will be missed, but she is where she wanted to be at the end of her life on earth, with Jesus in heaven, so please take comfort in that. We were so sorry to hear that we have lost such a great lady. Our loss is heaven’s gain. Vivian and Robie were so instrumental in our early christian life. They nurtured us and demonstrated how joyful a life devoted to Christ could be. Vivian was always busy and so full of energy, I have no doubt, she is probably polishing those streets of gold, as we speak. Til we meet again, dear friend. Cheryl and family and Byron : Sending sincere condolences on the passing of your dear mother——-A very lovely lady. I knew Vivian for several years through the Liverpool Seniors group. She was a lovely lady and will be missed by all. My sincere condolences. I would like to extend heartfelt sympathy to the family of the late Vivian MacDonald. to Vivian’s family.. so sorry to hear of your mother’s passing. she was a wonderful lady, and a good friend of my late mom’s..Florence Saulnier. My sincere condolences.